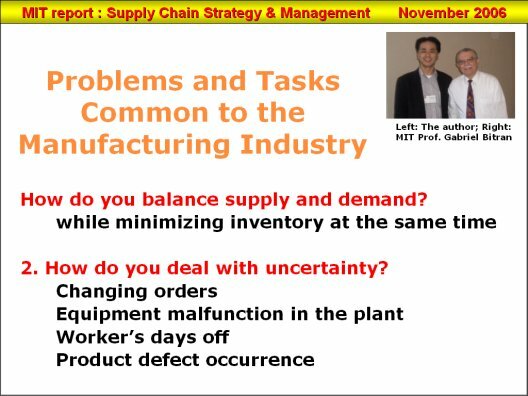 Q: What problems are shared by manufacturing companies throughout the world? How do you solve them? 1. How to strike the balance between demand and supply. 2. How do you deal with uncertainty? The customer's needs are diverse and that increases the number of goods. It is not at all unusual for several million types of goods to be flooding the market especially when you include variations in color, size and specification. The customer's demands to have a product delivered on time are also strict and changes are frequently made in orders. In an external market that becomes more and more severe every year, maintaining balance between supply and demand is a very important problem. Not only that, but inventories have to be held to a minimum. With rapid changes in model and short life cycle, stocks can quickly become repositories of obsolete items with values that sink close to zero. 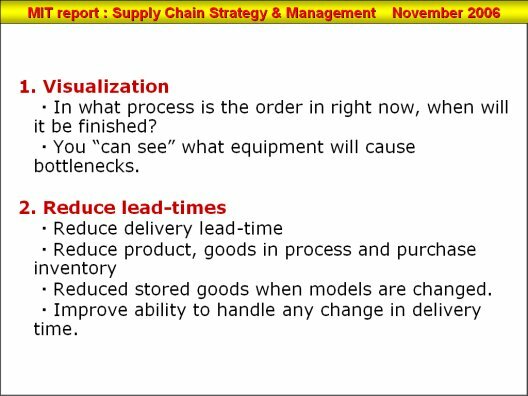 Product model changes are rapid, life cycle is short and thus inventories can easily become repositories of dead items with values sinking close to zero. The external environment changes, but so, too, does the internal environment. Machine and equipment breakdowns in the factory, loss of work hours due to illness, production of defective goods and uncertainties that we cannot forecast provide obstacles to just-in-time production. The solution that MIT provides to solve these problems is 1) visualize and 2) reduce lead-time. Visualization is the ability to see the present situation in the factory. What this means is that when you are looking at an enormous number and wide variety of products moving by, you cannot tell where the parts and product inventories are, what process each of the orders is in, and which orders might be delayed. The ability to see all this on a computer screen makes it easier to maintain a balance between supply and demand and accurately cope with any uncertainty, such as an unexpected accident. One could easily see a situation in which the effects of reduced lead-time would create a situation in which lead-time shrinks to zero. If lead-time were zero, and if it were okay to start purchase and production right before delivery, we would have inventory = zero and rate of compliance with delivery time = 100%. But, there can, in reality, be no such thing as zero lead-time. But, most definitely, the more that we can shorten lead time, the closer we would get to a situation in which inventories equal zero and the rate of delivery compliance is close to 100 percent. At MIT, they think of this situation of lead-time greatly reduced to near zero as JIT (Just in Time). We can see that from the MIT doctrine and its Virtuous Circle Map for Increasing Profits the first problems we have to tackle are visualization and lead-time reduction.